Democrat Barack Obama and Republican John McCain spent much of their second presidential debate Tuesday night arguing over how best to protect American jobs, homes and health care in the face of a floundering U.S. economy. Democratic presidential candidate Barack Obama, left, answers a question as Republican presidential candidate John McCain listens during a town hall-style presidential debate in Nashville, Tenn., Tuesday. Moderator Tom Browkaw is at centre. McCain swiftly announced that he would order the U.S. Treasury Department to purchase bad home mortgages and replace them with fixed-rate mortgages, presumably at the federal government's expense. "Until we stabilize home values in America, we're never going to start turning around and creating jobs and fixing our economy and we've got to get some trust and confidence back to America," said the Arizona senator, whose proposed program could cost up to $300 billion US. Though he acknowledged that it was an expensive idea, "it is my proposal. It's not Senator Obama's proposal. 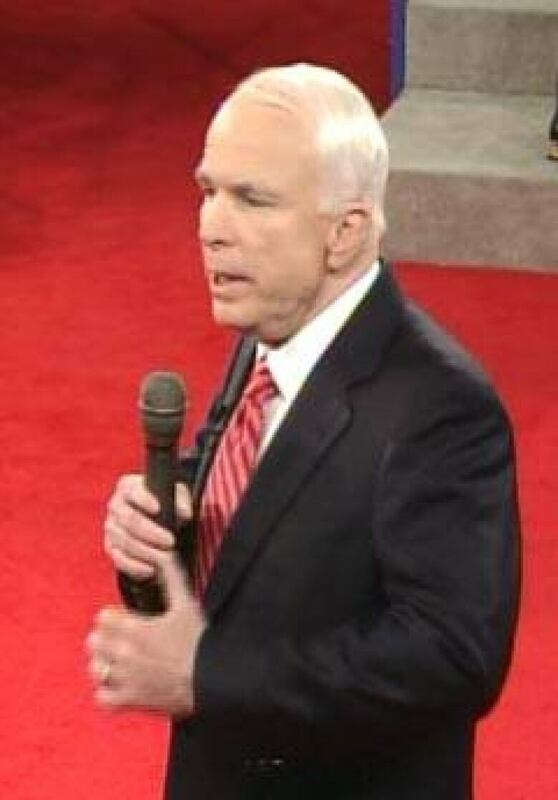 It's not President [George W.] Bush's proposal," McCain said at the beginning of the 90-minute debate. Calling the financial crisis the worst the U.S. has seen since the Great Depression, Obama once again blamed the problem on the failed economic policies of the past eight years. Bush, McCain and others had favored deregulation of the financial industry, predicting it would "let markets run wild and prosperity would rain down on all of us," the Illinois senator said. "It didn't happen." He said the recently approved $700-billion US financial bailout package was just the first step in rectifying the problem, and would require strong oversight to make sure "investors, taxpayers are getting their money back and treated as investors." Obama didn't comment directly on McCain's proposed mortgage buyout plan, which reportedly would be paid for by the bailout legislation, but he has said previously the idea should be studied. His campaign on Tuesday night said McCain's proposal was not a new one. Observers of the town-hall style debate watched to see whether renewed friction between McCain and Obama in campaigning for the Nov. 4 vote would lead to sparks as they faced off. 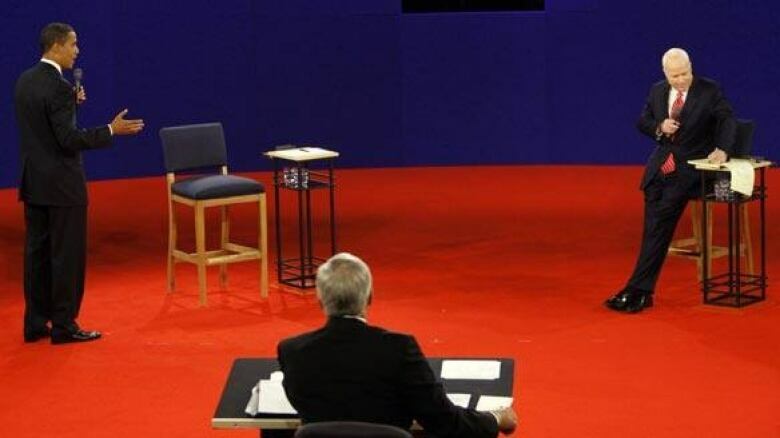 The debate, which began at 9 p.m. ET, was held at Belmont University in Nashville and moderated by Tom Brokaw of NBC News. The candidates faced questions from members of a group of about 100 undecided Nashville voters identified by the Gallup polling company, who met with Brokaw beforehand so he could select the questioners. Though they had the freedom to roam the debate stage to get closer to their audience, both men spent much of their energy — and time — denying the other's fiery accusations. McCain said Obama was the Senate's second-highest recipient of donations from individuals at Fannie Mae and Freddie Mac, the two now-disgraced mortgage industry giants. Obama quickly retorted that McCain's campaign manager, Rick Davis, has a stake in a Washington lobbying firm that received thousands of dollars a month from Freddie Mac until recently. 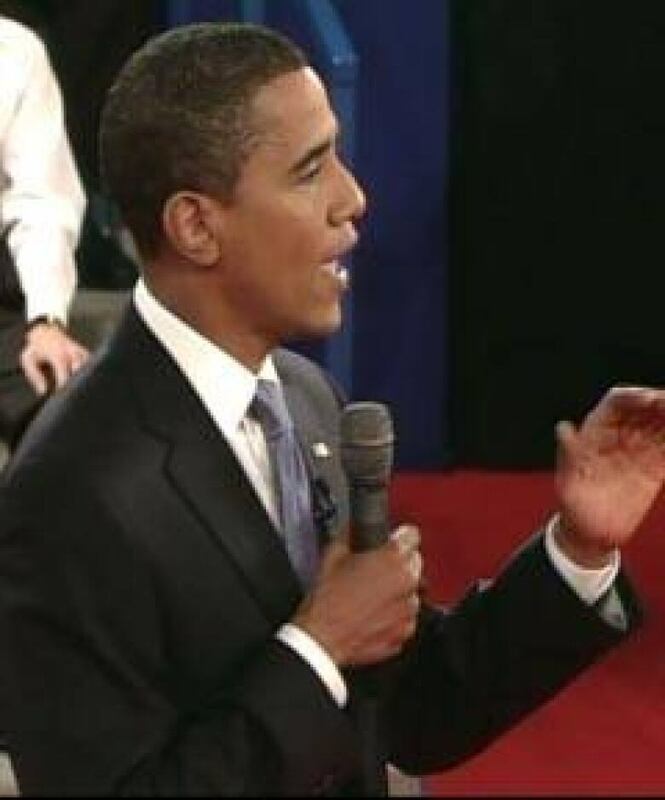 But Obama quickly changed his tone, turning to the audience to say, "You're not interested in politicians pointing fingers. You're interested in the impact on you." Recent opinion polls show McCain trailing Obama nationally by anywhere between three and nine percentage points. McCain was looking to use Tuesday night's debate to make up ground he has been losing in the White House race in the wake of the ballooning financial crisis in the United States and abroad. As the frontrunner, Obama was expected to maintain a cautious approach in the debate, avoiding personal attacks in an attempt to "remain above the fray," the CBC's Henry Champ said earlier Tuesday. Both, however, took ample opportunity to criticize the other's positions on energy, spending, taxes, foreign policy and health care. The two men have taken drastically different approaches on how to deal with the millions of Americans who lack health insurance. While McCain has proposed a $5,000 tax credit to allow families to finance their own health care, Obama has said he favours a system where coverage is provided through the workplace, with government funding to help uninsured families obtain coverage. "The point is that we have got to give people choice in America and not mandate things on them and give them the ability," to acquire insurance as they see fit, said McCain. He called health care a responsibility. Obama, however, described it as a right. "For my mother to die of cancer at the age of 53 and have to spend the last months of her life in a hospital room arguing with insurance companies … there's something fundamentally wrong about that," he said. The two men encountered greatest friction on foreign policy. Repeating criticism delivered during the first presidential debate last month, McCain slammed Obama for saying that he was willing to launch attacks against militants operating inside Pakistan. "I'm not going to telegraph my punches, which is what Senator Obama did. I'm going to act responsibly," said McCain, adding that he would seek to work in harmony with the Pakistani government's efforts to fight militants. Obama said the U.S. must provide more non-military aid to Pakistan, the heartland of the war on terror, at the same time that it puts pressure on the country to root out extremism. He also repeated a call for more troops in Afghanistan to quell a growing insurgency there. And in his own defence, Obama challenged McCain's caricature of him as an inexperienced leader who spoke too aggressively on the issues. "This is a guy who sang bomb, bomb, bomb Iran, who called for the annihilation of North Korea — that, I don't think, is an example of speaking softly," Obama said. In recent days, McCain has gone on the offensive against Obama, questioning his character. In an address in Albuquerque, N.M., on Monday, McCain said Obama had accused him of opposing regulation that could have avoided the U.S. financial crisis. Obama, in turn, has rejected the McCain campaign's charges, saying the Republicans were resorting to smear tactics to distract voters from the issues facing the country. The accusations came as Obama's campaign rolled out a 13-minute video on Monday revisiting McCain's connections with Charles Keating, who was convicted of fraud after his savings and loan bank collapsed, costing U.S. taxpayers billions of dollars. Polls judged Obama the winner of the first debate two weeks ago, but the town hall format was seen as an advantage for McCain, who has used such events to good effect numerous times in this year's Republican primary race and in his failed presidential bid in 2000. The third debate is scheduled to take place at Hofstra University in Hempstead, N.Y., on Oct. 15.